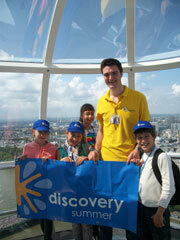 Why work for Discovery Summer? We are a passionate, student-focussed company striving for excellence. Our dedicated Head Office team works throughout the year planning and developing innovative and exciting programmes which incorporate the best of British culture. Our residential courses are run at leading UK independent schools with outstanding facilities for study, recreation and sport. Our London teaching centres are both located in Kensington. All are exceptionally well-resourced. Over 60% of our staff return each summer. The majority of our senior centre staff have worked with us previously, many for over 10 years. Acquiring new skills and competences will help advance your career. Staff are given a thorough induction and performance is regularly reviewed. Training and shadowing opportunities are available for those interested in promotion. Discovery Summer is strongly committed to safeguarding and the well-being of all in its care. Applications now open for summer 2019. Complete our APPLICATION FORM now.